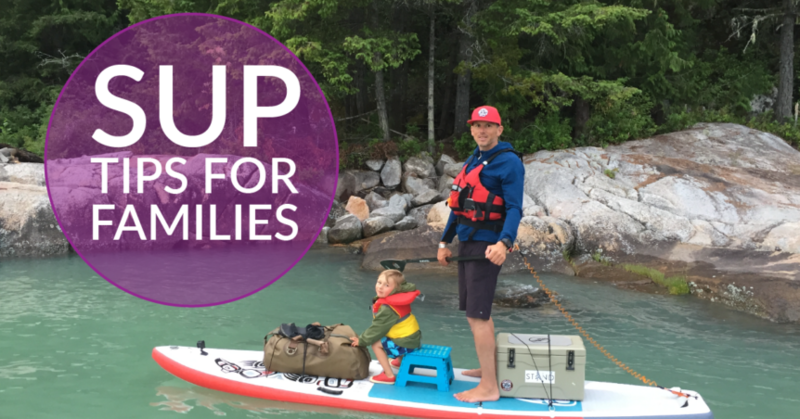 Want to SUP with kids? Transport Canada requires you to have a PFD/life jacket (with sound signalling device such as a whistle) that is approved and fits you properly as well as a throw bag! On your PFD you should carry some sort of communication device (cell phone in a dry bag or a marine radio). Let someone know where you are going, and if you can, always paddle with a partner you trust. For longer trips, in a dry bag that will fit under some bungee cords at the front of your board you can have a first aid, kit spare clothes, rain jacket, insulated jacket and also carry some food and snacks. Always a great idea to take a lesson so that you are solid on the board and can lead your family into a new sport with confidence! 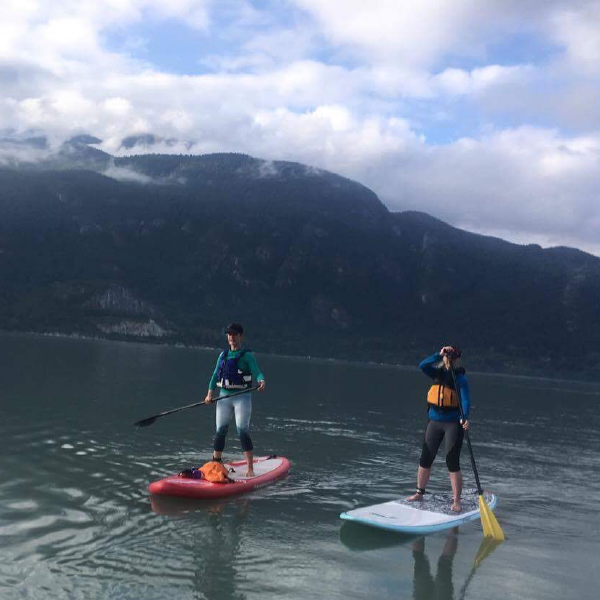 We have paddled with Coastal Stoke SUP in Squamish and the safety techniques, tip & tricks have been amazing! We strongly suggest checking them out. Our oceans are gorgeous places to explore but should not be taken for granted. BC weather and water conditions change quickly, so be ready! Can I bring my child on the board? YES! Kids love being on the board with you and it’s a great way to spend time togther! 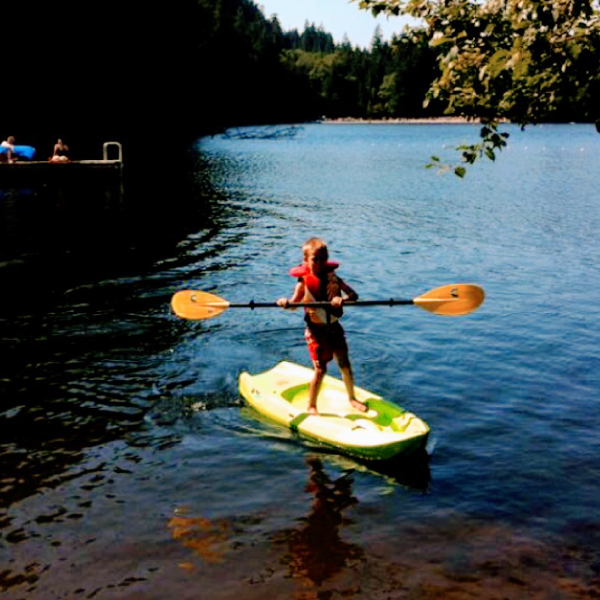 The person paddling the child should be confident and possess a solid skill set. The child must be wearing a PFD and it is not a bad idea to have some type of tether or leash attached from the child to the board. Always a good idea to stay close to shore and monitor weather and wind carefully if traveling any distance with children on the board. Great tip from Norm is to use a step stool as a place for a small child to feel solid on the board. They love to help paddle! What kind of board should I get? Inflatable board or not? Generally, it’s more about what your goals are with SUP! For recreational use an inflatable is a really great way to go. They are very durable, easy to store and transport and the improved technology has made them more efficient and responsive. 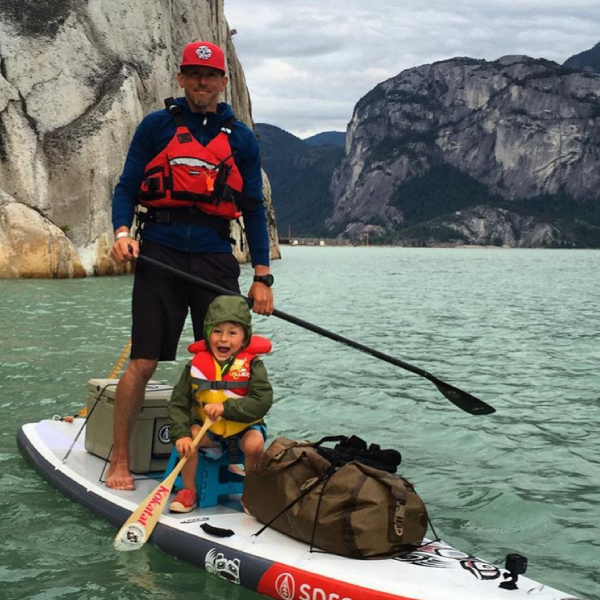 A big family upside is that they are also a lot lighter and easier to handle for smaller paddlers! Hard boards are generally better for performance if you are racing, surfing, or down winding. What to look for in a SUP board? The first thing you should be looking for if you getting into the sport is stability. If you are looking to play around on the lake occasionally then an “all round” board design is best. This will also have more room on the front of the board if you are looking to bring kids out with you. If you hope to transition into longer paddles on flat water or ocean, then look for “touring style” board vs the “all around” board shapes. You will experience better efficiency in a flat water or ocean environment with touring style shape. But…what you gain in efficiency you can lose in stability and room on the board so a solid skill set is key. Tough one! Again the answer depends on what you want to do with it. Going to the lake and leaving it there or using it a few times in the summer and you may be okay with a board in the $500-$800 range from Costco or somewhere like that. 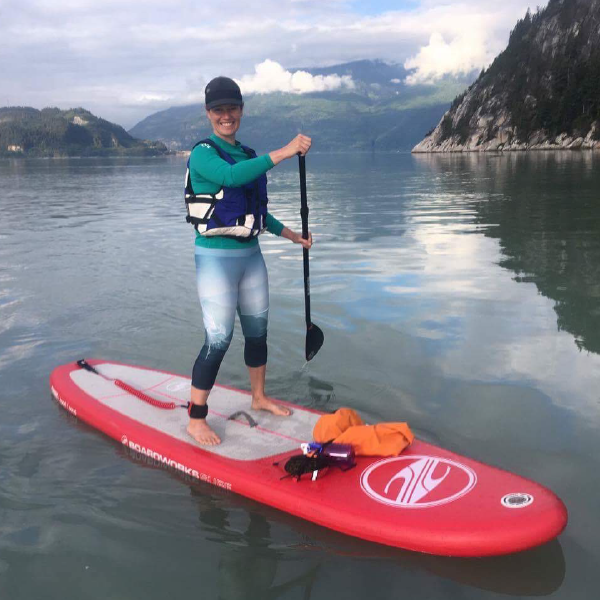 If you are looking to use the board more and have it develop into an activity that you can do on the ocean & lakes or take on trips, then you are looking at a board in the $1000 – $1500 range from more well known brands such as Sprout, Kahuna, Aegir SUP, Red Paddle or Chilliwack local Pure Life Paddle Boards (who even have a child sized board called the Minnow). These will be substantially lighter and offer better performance. Don’t forget, a good paddle is a key tool not to be overlooked! A great one to try is from Blackfish paddles. We really liked these. Another alternative to the full SUP if you are looking for lake fun with your kids is a sit on kayak. We have been enjoying our Lifetime Wave for 5 years and at $139 it make an affordable option that is a real hit at the lake! 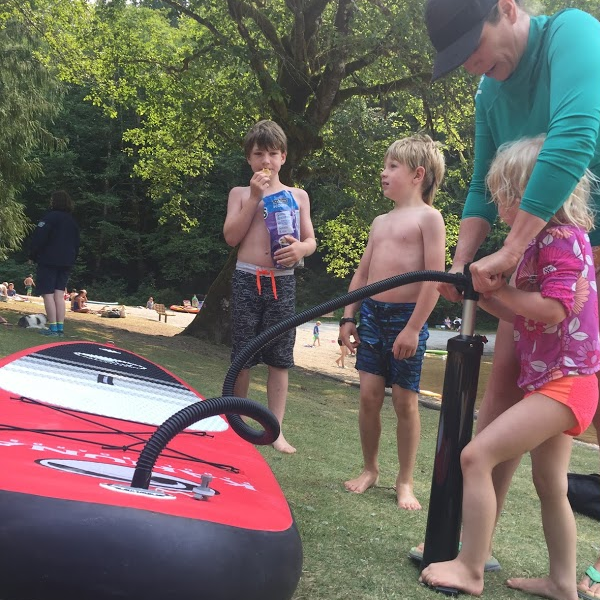 Kids can sit, kneel & even stand to paddle and holding up to 130 lbs it can fit a few kids at once. Children should be supervised at all times.